Day 1 in the potty training house! This is just a very quick update on how it’s all going – exhausting! Although Lucia was very excited to get her big girl pants on she decided pretty quickly that she hated the potty!! 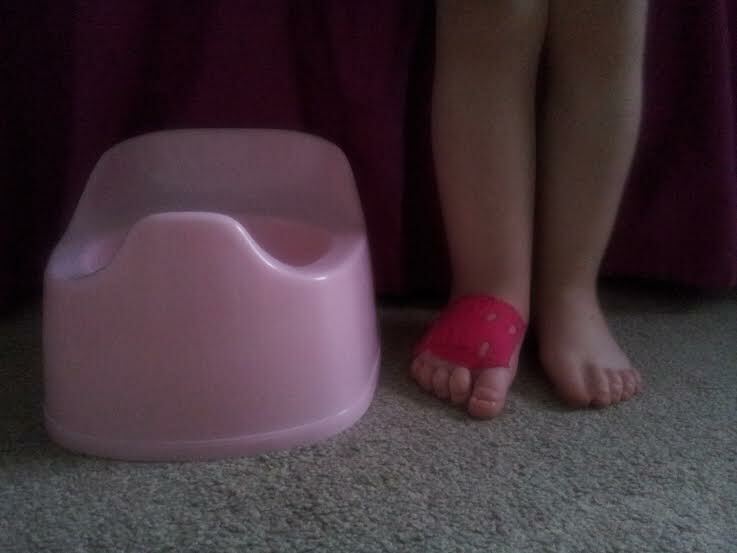 It took most of the day to even get her to sit on the potty for longer than 5 seconds – she point blank refused all morning so we had a couple of accidents as expected. However, we turned a corner in the afternoon thanks to Max. When he got home from school he very kindly sat on the second potty to coax Lucia into sitting on hers – and it started to work. We kept at it all afternoon and by 6pm we finally got a pee in the potty!! Max was as excited as I was though I think our enthusiasm may have scared Lucia a little! Though she couldn’t wait to tell her daddy when he got home from work. Lymphoedema-wise so far so good. I put ‘Cure Tape’ (in bright pink!) which is a type of kinesio on her foot to help with the fluid movement, as we used to do before we had garments. I didn’t see any point in putting it on her legs as any accidents would just soak it. So we have done plenty of dancing, walking, running and trampolining in the house to keep the lymph moving and everything looked and felt great this evening. Right now I am having a cup of tea and a movie to chill out before doing it all again tomorrow!